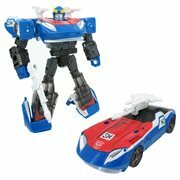 Transformers Fans - Roll Out for Cybertronian Toys and Collectibles! of transforming mecha in 1984, Transformers has come a long way to include not only the toys that transform, but also action figures, mini-figures, vehicles, model kits, role-play items, and even computer accessories generated by a galaxy of highly entertaining motion pictures, comic books, animation, and video games. So, whether your fandom dates back to those early beginnings or you've been lured on board by more recent enticements like the The Last Knight and Bumblebee films, TV series such as Titans Return or Power of the Primes, or the array of video games available for play, you've got a lot to choose from in the way of fun toys and exciting collectibles. Which Transformer is your favorite? Is it Optimus Prime, Bumblebee, Megatron, Drift, Grimlock, Starscream, or some other Autobot or Decepticon? Regardless, you're very likely to find all your favorite Transformers toys and action figures here at Entertainment Earth. Order these incredible items for yourself or a friend... and maybe you'll save the world! "Freedom is the right of all sentient beings," and cool stuff is the right of all Autobot and Decepticon fans! For a franchise that began as a toy line of transforming mecha in 1984, Transformers has come a long way to include not only the toys that transform, but also action figures, mini-figures, vehicles, model kits, role-play items, and even computer accessories generated by a galaxy of highly entertaining motion pictures, comic books, animation, and video games. So, whether your fandom dates back to those early beginnings or you've been lured on board by more recent enticements like the The Last Knight and Bumblebee films, TV series such as Titans Return or Power of the Primes, or the array of video games available for play, you've got a lot to choose from in the way of fun toys and exciting collectibles. Which Transformer is your favorite? Is it Optimus Prime, Bumblebee, Megatron, Drift, Grimlock, Starscream, or some other Autobot or Decepticon? Regardless, you're very likely to find all your favorite Transformers toys and action figures here at Entertainment Earth. Order these incredible items for yourself or a friend... and maybe you'll save the world! Transformers is a media franchise produced by toy companies Hasbro and Takara Tomy that began in 1984 with the Transformers toy line. It centers on opposing factions of alien robots in a struggle for dominance or eventual peace. 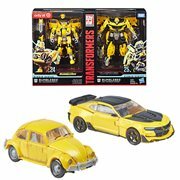 In addition to merchandise, the franchise has expanded to encompass a broad spectrum of comic books, animation, video games, and an extremely popular series of films: Transformers, Transformers: Revenge of the Fallen, Transformers: Dark of the Moon, Transformers: Age of Extinction, and Transformers: The Last Knight. Taglines like "More Than Meets the Eye" and "Robots in Disguise" refer to the sentient Transformer robots' ability to morph into common forms like cars, aircraft, or animals. 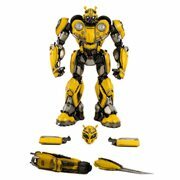 Action figures featuring this amazing capability in the form of key Cybertronian characters are very much in demand, and Entertainment Earth is where you'll find them. "You are not alone. We are here. We are waiting." The List of Must-Have Items Is Almost Limitless. Grounded in Transformers: Generation, Robots in Disguise, the "Unicorn Trilogy," Transformers: Animated, and many more, there are simply too many collectibles and playthings to mention. Examples include car graphics, games, playing cards, tin totes, mugs, water bottles, books, playsets, RC toys, vehicles, vinyl figures, lights, statues, magnets, model kits, flash drives, tote bags, and wall decals. And for those die-hard fans who prefer to wear their fandom, there are terrific Transformers hats, T-shirts, and additional clothing and accessory items that include necklaces, cufflinks, and other jewelry. Your Favorite Heroes Are Here! 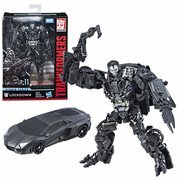 The vast roster of characters featured in these cool items includes movie greats like Optimus Prime, Bumblebee, Ironhide, Jazz, Ratchet, Sideswipe, Grimlock, Megatron, Starscream, Blackout, Barricade, Soundwave, Shockwave, and Grindor, plus many more from the films and other genres too numerous to list. 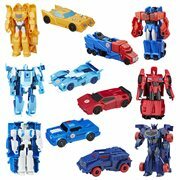 So, there are plenty of Transformers: Titans Return mini-figures and other goodies to make you happy and impress all your friends and fellow collectors. Don't Just Watch the Action - Live the Action! Of course, if you really want to make an impression and have a heck of a lot of fun doing it, you should get a load of the fantastic Transformers roleplay helmets, swords, shields, cannons, and more Entertainment Earth has to offer. They put you into the action! "It's a great place for the toy collector. I have bought here before and I will continue to buy from Entertainment Earth. Love it!" "It's a great place for the toy collector. I have bought here before and I will continue to buy from Entertainment Earth. Love..."